NorCal Tennis Czar: Zhang turns tables on No. 2 seed Fritz in S.F. Zhang, however, played so much better that he looked like a different player. The 26-year-old qualifier from China stunned the second-seeded Fritz 6-4, 4-6, 6-2 in the $100,000 KPSF Open indoors at the Bay Club SF Tennis Center. 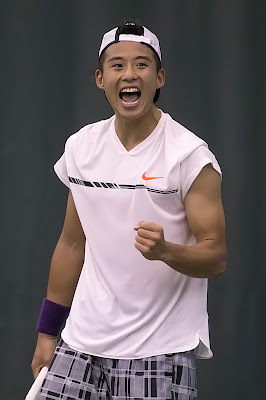 One week after losing to Fritz 6-4, 6-3 in the $125,000 Dallas Challenger, the 6-foot-2 (1.88-meter) Zhang repeatedly frustrated the 19-year-old U.S. sensation with booming serves and pinpoint groundstrokes. Fritz could only hang his head in dismay or smile in amazement as shots whizzed by him. Zhang won the last four games of the hard-hitting match, breaking Fritz for 3-2 on a spectacular backhand passing shot down the line and for 5-2 when Fritz netted a backhand. Zhang closed out the match with a service winner for 40-30 and another backhand passing shot down the line on his first match point. 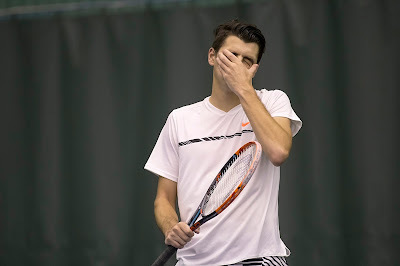 Fritz, the runner-up to countryman Ryan Harrison in Dallas, didn't suffer a letdown or underestimate Zhang. Far from it. "I felt like I played better this time," allowed the 6-foot-4 (1.93-meter) Fritz. "There was just one game I regret in the third set where I dropped my serve the first time. I gave him a double fault, and I gave him an error on both of my game points. Even that being said, I still played pretty good that game, and on the break point, I couldn't have played it any better. These are the losses where I just have to be like, why does it happen to me?" Fritz added with a laugh. "I thought I played at a pretty good level. We (Fritz and his coach, David Nainkin) were just talking about it. I served well, I thought I was crushing the ball, but he was just beating me up. The only thing was I couldn't quite find the timing on my backhand. Sometimes I really connected on it, sometimes I mis-hit it a bit, but still I thought I played a higher level than last week when I actually beat him. Sometimes people just play too good for you." It was nothing like Zhang's performance last week. "He played the big points incredibly well (Tuesday), something last week I was able to really capitalize on," said Fritz, ranked 83rd. "Last week, he double-faulted on some big points, he played tight on some big points, and today he showed really no fear on any of the big points, just coming up with the best tennis. That's a big change. He served better, he returned better, he hit his backhand so much better." Zhang, though, double-faulted into the bottom of the net to lose the second set. "That's the only thing he did in the last match that he actually showed me in this match," said Fritz, the son of former professional players Guy Fritz and Kathy May who became a father for the first time three weeks ago with his wife, former junior star Raquel Pedraza. "He gave me one double fault on the set point. Besides that, it was lights out on the big points, lights out for most of the match." Fritz easily could have lost to Zhang in Dallas. "Last week I came out and played a bad game to start the match and started myself down a break. 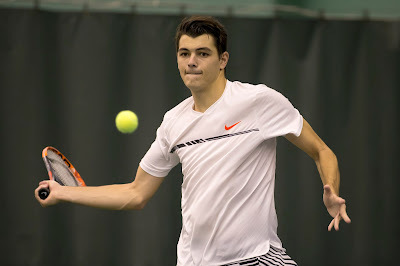 And I put myself down a break in the second set as well," lamented Fritz, who won his first two Challenger titles back-to-back in Sacramento and Fairfield in Northern California at 17 in 2015. "I knew he was good, and I knew he was dangerous. I could see last week he goes for it. He hits the ball big. Those are the type of people that can come up big any day." The 6-foot-2 (1.88-meter) Zhang, ranked No. 195, employed a simple game plan. "I needed just one rule: Just (be) aggressive, because last week I lost to Fritz in Dallas," Zhang said in broken English. "He's a good player. He (hurt me with his) serve and forehand (in Dallas). Many, many trouble. This match, I was just thinking I need (to be) aggressive. This is great." Beating top-100 players is nothing new to Zhang, His best victory came over then-No. 14 Richard Gasquet of France to reach the quarterfinals in Beijing on the ATP World Tour in 2012. At least Fritz will have time to rest before next week's Memphis Open on the ATP World Tour. It's a big tournament for him, because if he doesn't at least match his runner-up finish to Kei Nishikori there last year, he will drop in the rankings. John-Patrick Smith also beat a young American seed on Tuesday to avenge a recent loss, but that upset was more predictable. Smith, a 28-year-old Australian left-hander, ousted Jared Donaldson, seeded fourth, 6-3, 7-6 (4) after losing to the promising 20-year-old 7-6 in the third set in the second round of qualifying in Brisbane last month. Donaldson, the runner-up to Fritz in the 2015 Sacramento Challenger, reached the third round of the U.S. Open as a qualifier last September. He knocked off David Goffin and Viktor Troicki -- then ranked No. 14 and No. 32, respectively. Top-seeded Frances Tiafoe, 19, beat fellow American Bradley Klahn, the 2010 NCAA champion from nearby Stanford, 6-4, 6-4. Tiafoe reached the second round of the Australian Open as a qualifier last month for the first of likely many Grand Slam victories. Klahn, a 26-year-old left-hander who climbed to a career-high No. 63 in the world in 2014, returned to the circuit in November after sitting out for almost two years. He underwent his second operation for a herniated disc in his back in February 2015. The first was in 2011. "He's obviously a very good player and hungry," Tiafoe said. "I'm really happy to see him back out playing again. He's a really nice guy and definitely has a lot of game, so I knew it was going to be a tough match." Sixth-seeded Peter Polansky of Canada dispatched Dennis Novikov of Milpitas in the San Francisco Bay Area 6-2, 6-2. Polansky won the 2013 Tiburon Challenger across the Golden Gate Bridge from San Francisco. Here are the singles and doubles draws and today's schedule.